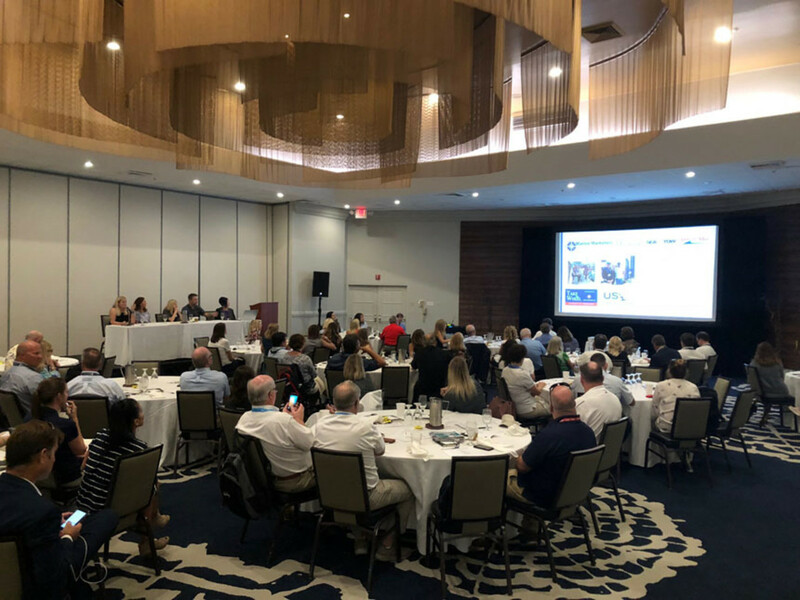 One hundred marketers and industry leaders gathered yesterday afternoon at the Fort Lauderdale International Boat Show for the annual meeting of Marine Marketers of America. The discussion focused on the topic of CX and the need for marine businesses to understand, adopt and implement it. “CX refers to the customer experience, the sum total of all touchpoints between a customer and a business, embodying the entire life cycle and all phases of the relationship,” said MMA president Wanda Kenton Smith, who facilitated the panel discussion. Kenton Smith noted that CX embraces everything from a customer’s initial awareness and discovery through the stages of nurturing, purchase, post-service and advocacy. “While the lion’s share of traditional marketing budgets and effort previously centered on prospective customers, there has been a major shift nationwide among leading marketers to expand the focus and funds to include prospects and customers at all touchpoints … before, during and long after the sale is transacted,” Kenton Smith told the group. Kenton Smith said she stumbled on published research results by two major marketing organizations earlier this year that identified CX as the No. 1 priority for North American marketers. This led to a marketing column published in the September issue of Soundings Trade Only. “The column sparked a lot of interest among colleagues, hence the development of the panel presentation,” she said. Four industry experts with internal CX programs were tapped to present best practices: Matt Gruhn, president of the Marine Retailers Association of the Americas; Lee Sanderlin, director of digital marketing and Web for the NMMA; Amanda Ward, campaign and Web content manager for MarineMax; and Margriet Mitchell, director of marketing for Jeanneau America and Prestige Yachts. Gruhn shared recent Grow Boating research that noted 66 percent of lapsed shoppers at marine dealerships in the United States failed to consummate the sale because they did not have a helpful experience. 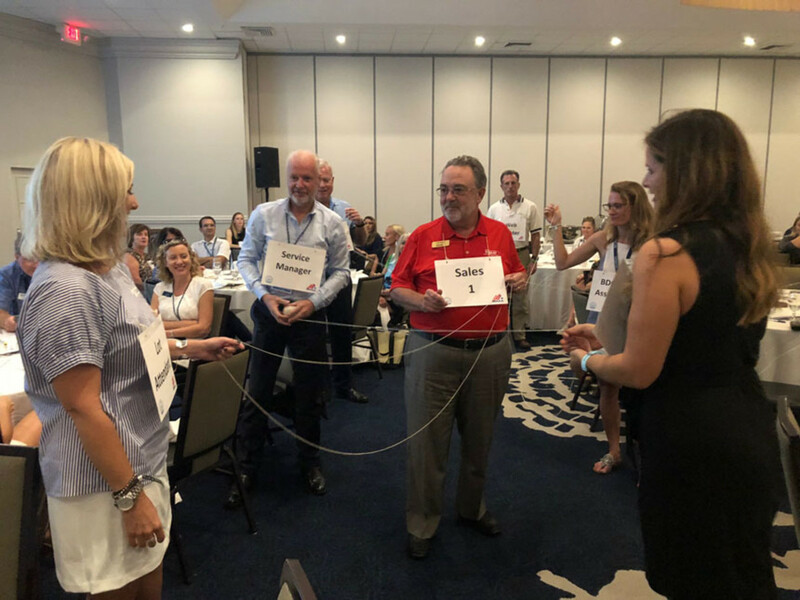 To illustrate the potential opportunities for a retailer to either build the relationship or drop the ball, Gruhn presented an interactive exercise that demonstrates how CX works. He used a ball of yarn tossed between a series of identified prospect contacts, including the webmaster, the individual responsible for lead assignment, sales staff members, the lot attendant, the service writer, the service tech and the dealer receptionist. “Everyone at the dealership is included in delivering a perfect customer experience,” Gruhn said. He noted that a customer who is pleased with their experience is more forgiving when they’re dissatisfied with a product, while a customer who is unhappy is more likely to walk away from the dealership and the boat brand. Sanderlin, the guru behind NMMA’s CX and digital marketing program, quoted Steve Jobs to reference her approach. “You’ve got to start with the customer experience and work back toward the technology,” she said. “It’s always about the customer,” Sanderlin said, noting that customers take charge of how they choose to engage with brands, how they consume content and how they shop. Sanderlin said marketers must minimize opportunities for customer abandonment, ensuring the right messages and information are delivered at every touch point. She emphasized the importance of leveraging landing pages for inbound tactics, creating personalization and establishing a clear call to action for customers to follow. She also encouraged leveraging technology, including marketing automation tools, content management and Web-based solutions, as well as heat map technology. MarineMax includes a comprehensive owner email program that generates an average 45 percent open rate and 8.3 percent click rate. The emails feature a video spotlight and welcome message from a different team member. MarineMax is also an early adopter of artificial intelligence, using an AI assistant to find and re-engage lost or lapsed prospects. However, its largest marketing tool is designed to get people to use and enjoy their boats. They strategically deliver CX through a classes, seminars and events. Mitchell, of Jeanneau America and Prestige, focuses her marketing and CX efforts on engaging two separate silos: their dealers who represent both sail- and powerboat brands, and prospects and customers from both camps. Jeanneau’s primary CX initiative focuses on boat shows. The manufacturer invests in dealership training, while providing partnerships in educational programs; VIP experiences, including owner parties and branded gifts for buyers and kids; plus experiential “Take the Wheel” programs with free boat rides. They also encourage prospect and customer interaction with senior management, women’s cruising groups and celebrity members of the U.S. sailing team. Other areas of CX focus include owner gatherings, customer advocacy programs and the recent launch of “Jeanneau Underway,” a YouTube storytelling platform that allows customers to share their cruising experiences. “The MMA panel on CX was very enlightening and demonstrated that a great CX doesn&apos;t just happen; it requires thoughtful consideration about all the touch points with the customer and the importance of nurturing customers before and after the sale,” said NMMA president Thom Dammrich, after the discussion. Kenton Smith noted her next STO column will expand on CX expansion, based on the FLIBS presentation. View or download the MMA PowerPoint “Why CX Should be Your Marketing RX” here.